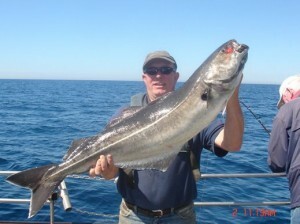 Courtmacsherry offers the angler a wide variety of fishing – shark, bottom and wreck fishing. Tackle can be rented at reasonable rates, if required. Further offshore, due to the effects of the Gulf Stream, sharks can be caught. All fish are tagged and released in the interests of conservation. Wreck fishing is available and many wrecks are in close proximity to Courtmacsherry. Skate (215 cm x 155 cm)We catch at least 20 ton up skate landed every season. Coalfish (31lbs)Broke Irish Record twice.24 Specimens recorded on one day 2001. But Courtmacsherry really hit the headlines in 2000 by smashing 2 Irish records which had been in existence for a total of 52 years. The 2 new Irish records were a ling of 48.5lbs and a coalfish of 27.6lbs.They were caught by Tony Sol from Amsterdam and John Tom from Rotterdam respectively.The Coalfish record was again broken by Charlie Robinson from the “Lady Louise “in Nov 2002. Other notable catches include blue shark to 2.49mtr, all skate and shark are tagged and released.